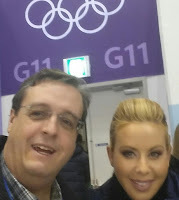 With Saturday as a scheduled recovery/logistics day -- resting/relocating to coastal Gangneung for the next 12 days -- all bright eyed on Sunday I made it to my first PyeongChang 2018 Olympic event: Figure skating. As I write this Monday afternoon, the two-day Team Event just concluded with Canada taking home gold, Olympic Athletes from Russia (OAR) silver and Team USA earning bronze. For non-photo journalists, the venue is set up with a media tribune spanning a couple of seating areas for broadcasters to air live commentaries, a few rows of tabled seats for writers with laptops, then corners of the arena for non-tabled press (that's me). 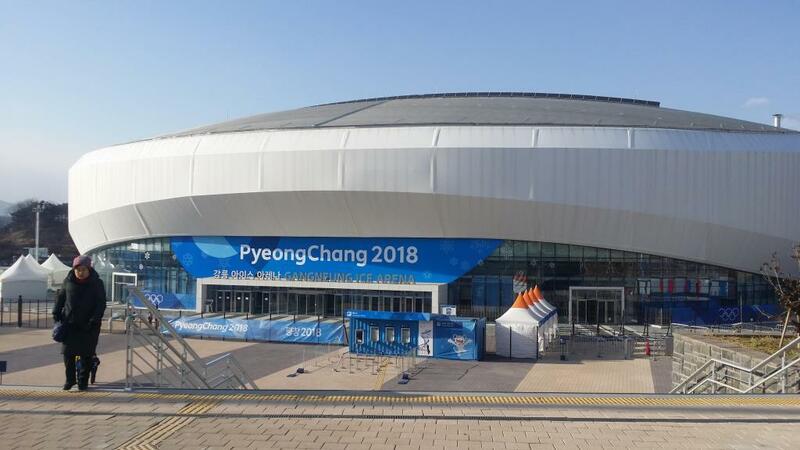 Generally we are able to roam freely and to the ground level of the venue, which includes a "mixed zone" for athletes and journalists to stand in a queue for 1x1 or group interviews. There's also a big media tent with tables space for about 300 reporters, mostly filled both days. I read that spectators filled about 88 percent of the stands on Sunday, and today was probably more like 90 percent. 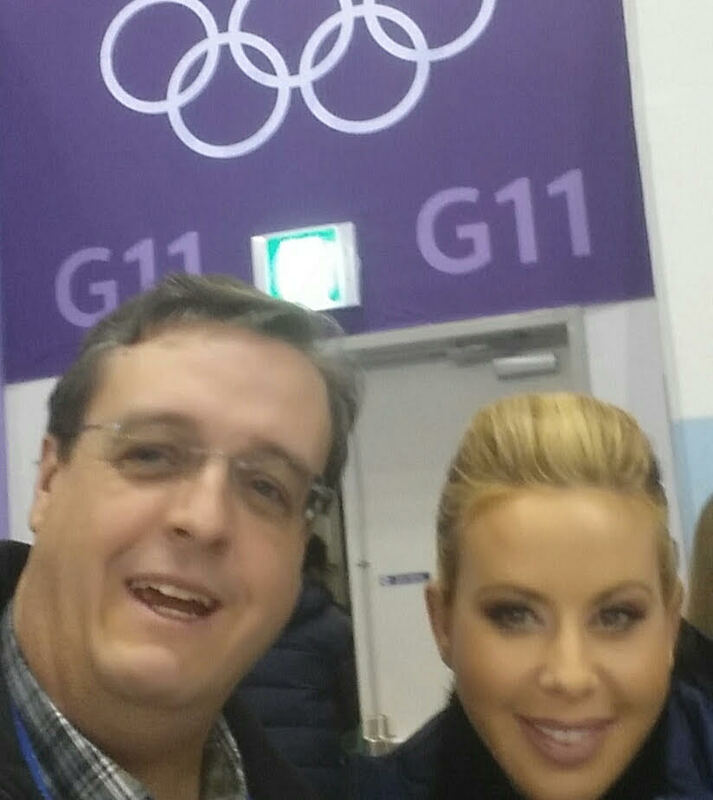 First interview in the mixed zone with Nicole Schott (GER) just after her Olympic debut. Her team publicist said she opted out of opening ceremony for rest, and I asked if she had any regrets about that choice. "I'm a really early sleeper, so I decided to concentrate on practice, but I'm going to do the closing." 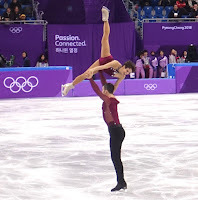 She considers one of her fellow competitors, Carolina Kostner (ITA) a hero, and Schott skated to one of my favorite Ennio Morricone compositions, "Nella Fantasia" performed by Jackie Evancho. 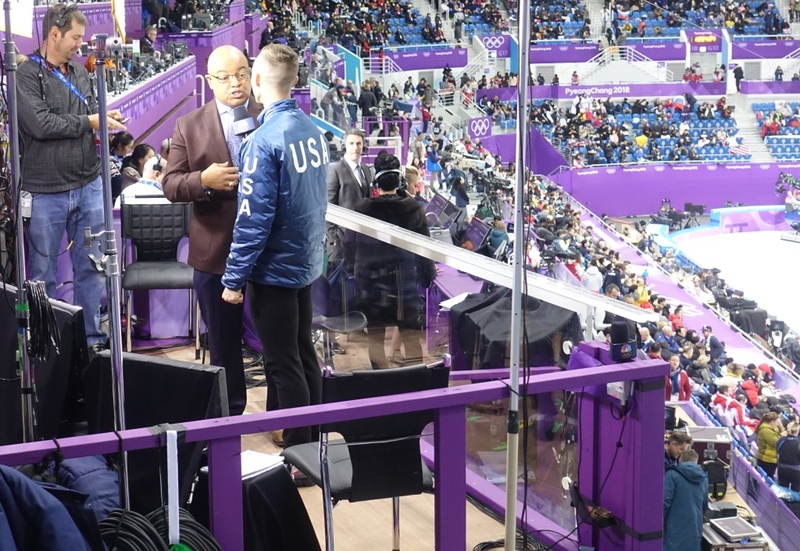 Conversation with pairs skaters Maia and Alex Shibutani, who spoke with The New York Times' Jere Longman II for a story on the 10 a.m. competition times to accommodate the Western Hemisphere broadcast schedule. "There is no extra challenge; it's not like we found out a week ago. 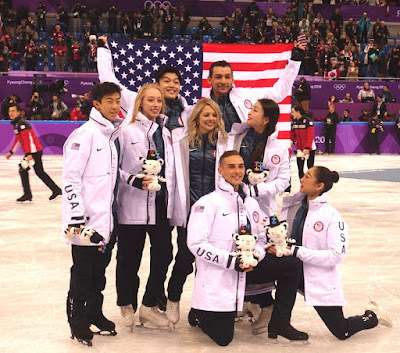 These are the best athletes in the world and they're gonna figure out how to get the job done" before answering my question about returning to Gangneung Ice Arena for their first 2018 skate on Olympic ice. Maia said, "It was really special to return. 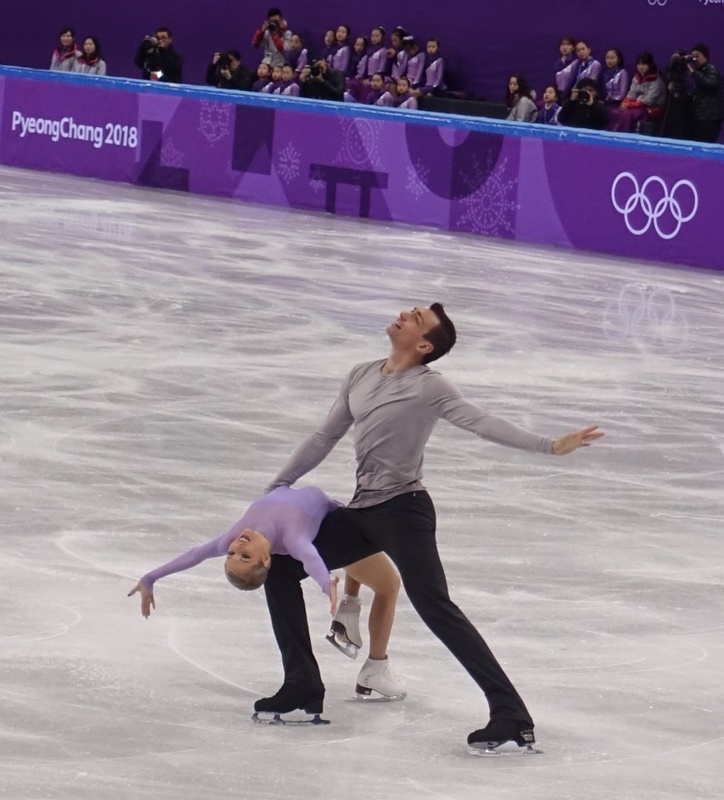 Before Sochi we did not have the opportunity to skate in the venue, so coming in [here] we had a year of positive visualization and just really happy memories, so being back here just feels really comfortable." 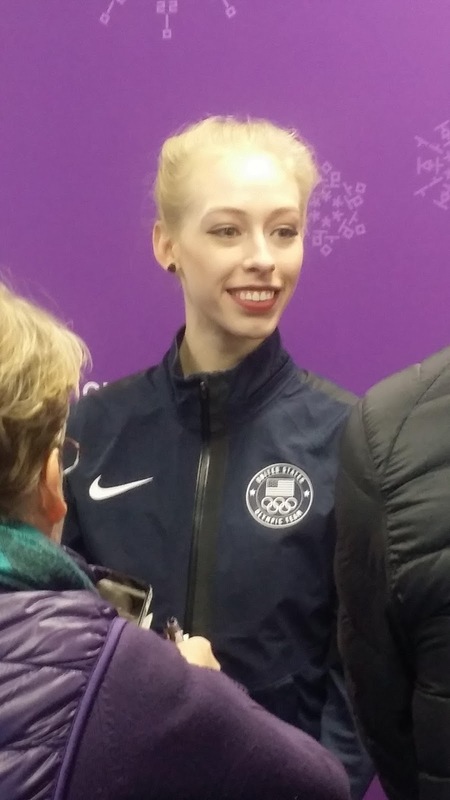 Group interview with Bradie Tennell, a first-time Olympian, who explained she gets psyched up for competition with 70s and 80s rock music by the likes of Metallica, Queen and AC/DC. "It's kinda weird because people look at me like, 'oh, blond hair blue eyes' but that music is great for getting pumped up." Longer 1x1 interview with Canadian pairs skaters Meagan Duhamel and Eric Radford. I cornered them about their choice of music, "Hometown Glory" performed by Adele, which left this blogger in tears during their skate. Duhamel explained that she first heard the song in 2007 at a small venue in Montreal where Adele performed she was "ADELE" selling out arenas. "She was wearing this big, blue T-shirt and I yelled, 'I like your T-shirt' and she was like, 'Thanks, I don't like getting dressed up' and I was like oh, my god, I love this girl and I really loved that song and always have, so we started using it in 2012," said Duhamel, who added that last year she saw Adele perform again at one of Canada's biggest arenas. "She's inspired us., From the day we heard [Adele's] music we were so inspired by her passion." Spotting Tara Lipinski and Johnny Weir in their commentary booth, later interviewing them about their PyeongChang experience so far. Donning my own Kodak Olympic pin featuring Lipinski's likeness, I asked the NBC Olympics duo if they ever thought of creating their own pins. 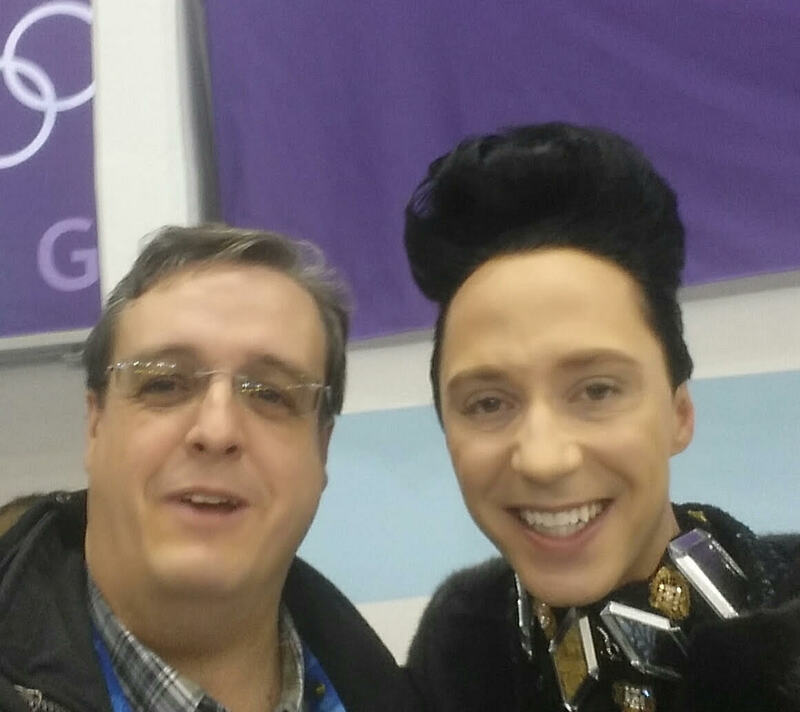 "We know that the Olympics are big about pin collecting and trading, but we don't have our own pin but that's something to think about," said Weir. 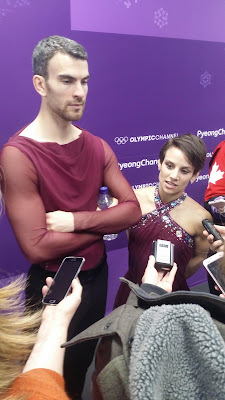 I brought up meeting Lipinski at Bud House in Vancouver (no surprise, she did not remember but was nice about it and laughed) and asked how things are going compared to Sochi. "We're having a blast," said Lipinski. 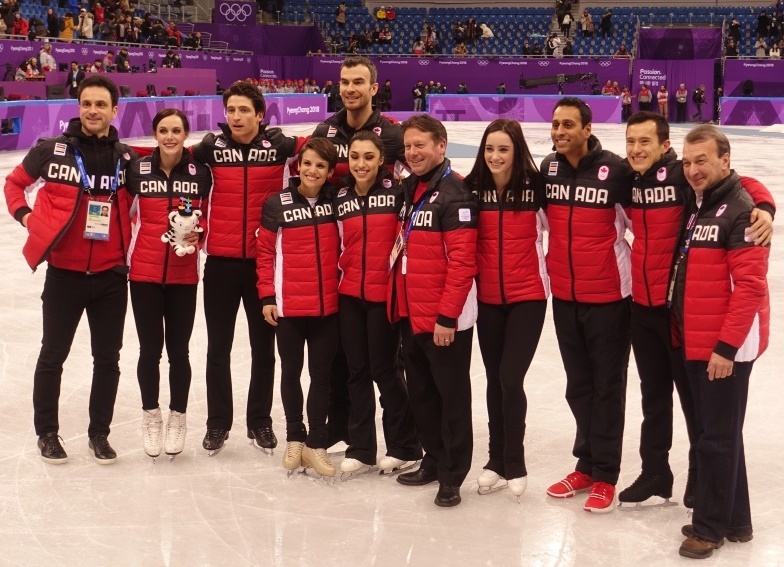 "We've been waiting for this moment since Sochi to sit in a prime time booth, and it's overwhelming -- we're loving it." Weir said they'd go the distance for many more future Olympiads if given the chance. "As long as people will have us -- we love this job, it's a privilege and an honor to represent our sport to the masses in the United States and to teach them what they're seeing and give them real talk; we have the most fun doing it -- it's a dream," said Weir. Accepting a request from Mirai Nagasu to trade a pin; she offered a huge U.S. 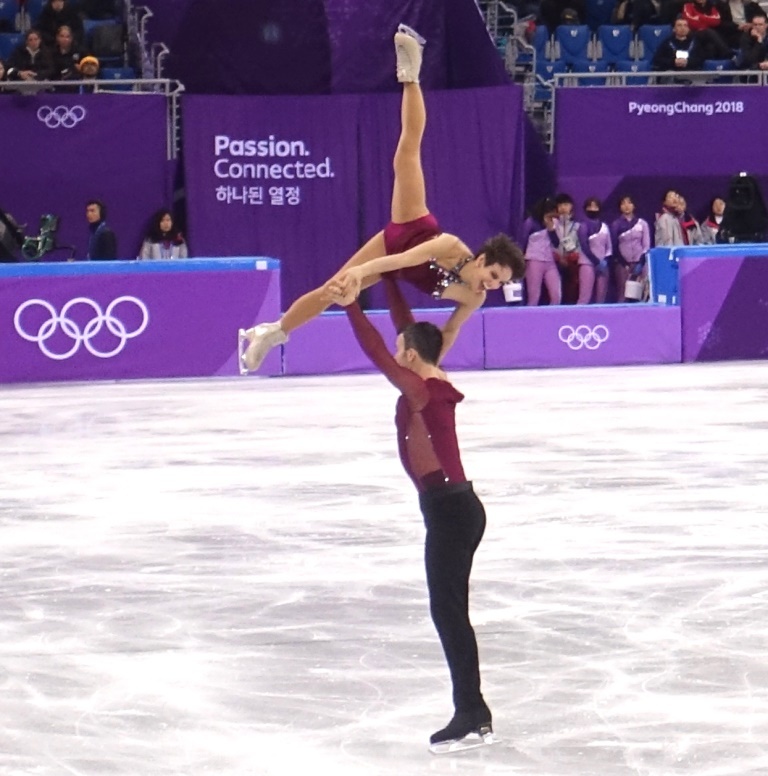 Figure Skating pin in exchange for a blogger pin for PyeongChang only moments after standing on the ceremonial medals podium (the medalist teams will accept their hard-earned hardware at Olympic Medals Plaza later tonight). What's a "blogger pin," Nick? Something all the bloggers there have in common, or something you made for yourself? Sounds like you are having an amazing time! Thanks for the inside peek at ground floor access -- keep it up & enjoy! Jill, I made 150 of my own pins for these Games and each Games since Vancouver. Will save one for you. They are great for trading, sort of a currency of the Games experience.